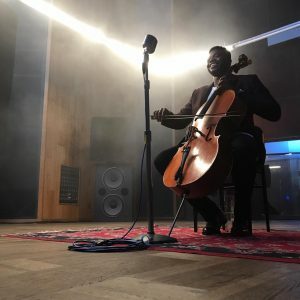 If you like to stay in the loop on the classical music, a cappella, or even popular music scenes these days, you’ve almost certainly heard of From the Top alum, Kevin Olusola. First featured as a saxophonist on Show 144 when he was 17, Kevin was invited back to perform on From the Top at Carnegie Hall on PBS, a TV series that received two Daytime Emmy Awards. While a student at Yale, he completed all his pre-med coursework before switching majors to East Asian Studies, and is now fluent in Chinese. It was during this time that his “celloboxing” version of Mark Summer’s “Julie-O” went viral across the internet and compelled a small, independent a capella group to invite him to join them as their human percussion section. That group would soon become today’s most well known and versatile a cappella ensemble: Pentatonix. Kevin’s uncanny ability to vocally reproduce and embellish any of the coolest pop beats on the charts led them to win the third season of NBC’s The Sing Off, record several platinum-selling albums, and win three Grammy Awards. 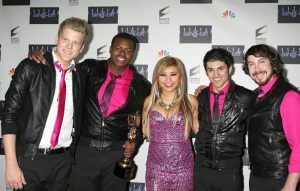 Kevin holds the Sing-Off trophy alongside the four other members of Pentatonix after being crowned the winners of Season Three. Kevin is living the celebrity life as he tours the world performing in huge stadium concerts and recording with Pentatonix, but this hasn’t stopped him from making his own material. He’s added electronic effects to his multi-instrumental talents, giving him the ability to accompany himself with more than just his cello. Check out the video below to see how he pulls it off, and if you love it, you can purchase it on iTunes and Apple Music, or stream it on Spotify!